If your gutters are damaged or leaking, New View Roofing is here to help you find the right gutters for your roof. We specialize in gutter installation, repair and maintenance services, and offer a wide selection of gutter colors and styles! We offer two basic gutter types: K-style and half-round. Both come in five- and six-inch widths, and are professionally installed by our experienced gutter specialists. K-style gutters come in many styles. They typically have flat bottoms and backs to fit seamlessly along the roof edge. The front side of the gutter often has a decorative shape that resembles crown molding. Half-round gutters are half-round tubes that are usually found on older, historic homes. We can design this style to match your existing exterior. Seamless aluminum. Seamless aluminum gutters are made on-site to fit a home. This eliminates seams and reduces the chance of leakage. Steel. This material is strong, durable and known for its longevity. Steel gutters can be easily painted to match any exterior. Copper. The benefits of copper are that it won’t rust and it doesn’t require paint. Its exceptional beauty can be seen on high-end residences and historic restorations. 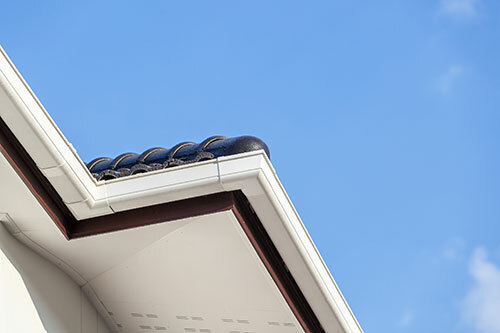 Contact Our Gutter Specialists Today! Need help finding the right gutters for your roof? New View Roofing is here to help. We have 25 years of experience in the industry and can assist you in finding the right gutter style and material for your home. Call (469) 232-7220 to learn more about our gutter installation services. You can also submit our online form to request a free inspection.